Farm to school programs have gained in popularity as districts and community farmers have connected. Farm to school activities provide a variety of benefits to students, parents, schools, communities, and food producers. The Farm to School program can be a strategy to help increase the consumption of fruits and vegetables in school meals and beyond. 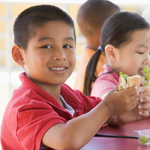 The U.S. Department of Agriculture (USDA) is a major promoter of the Farm to School program and offers resources to assist with the implementation. To access the resources, please visit the USDA Community Food Systems Web page at http://www.fns.usda.gov/farmtoschool/farm-school. Some of the information included on this Web page is a Planning Toolkit, Fact Sheets, Videos and Webinars, and Resources.